One of the side effects of this is that it turns up the dial on your hunger thermostat which reprograms you level of hunger upwards. You’ll also experience increased cravings as well as increased hunger. Studies show that when we eat sugar (fructose) in any form it turns on the “fat switch” which in turn causes cells to hoard body fat both in humans and animals. When you eat sugary types of foods a ton of chemical and hormonal reactions are set off in the body. A cascade of chemical reactions that do bad things to our bodies. Decrease HDL (our good cholesterol) levels and increased LDL (bad cholesterol) levels, elevated blood fats (triglycerides), higher blood sugar levels, and high blood pressure-all things that lead to the condition known as metabolic syndrome. Dietary carbohydrates especially fructose, are also the primary source of a substance called glycerol-3-phosphate (g-3-p), which causes fat to become fixed in fat tissue. At the same time, high carbohydrates raise insulin levels, which prevent fat from being release from the body’s cells. Fructose further tricks your body, turning off yoru body’s appetitie control regulation system which results in feeling hungry all the time even though you may have just finished a meal not long ago. As a result, you continue to overeat not only gaining excess body fat and weight but going on to develop insulin resistance which is the precursor not only to diabetes heart disease and cancer, but a long list of other chronic diseases as well. When we consume the wrong types of foods, in particular the wrong types of carbohyrates and turn on this “fat storing switch” it leads to weight gain, especially in the abdominal area. It then goes on to affect your health in other negative ways and can lead to serious disease. No amount of exercise or physical activity can compensate for this damage to the body cells and systems. We live in a modern world and the foods we consume that are now making us unhealthy, overweight and sick were not found un the diet of our ancient ancestors. Bottom line is this, fructose and the wrong types of carbohydrates-for example grains which break down into sugar in the body, lead to weight gain, obesity, weight loss resistance and on to other more serious health problems. They activate and program our bodies to continue to store fat rather than burn it and the only way off this merry-go-round is to remove them completely from our diets. 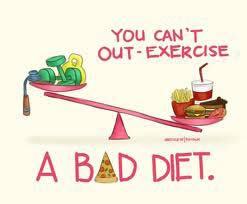 Truth is…you simply cannot out-exercise a bad diet.